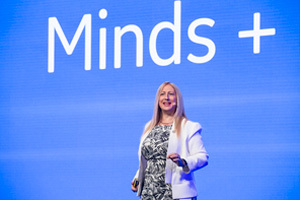 Deborah Sherry is senior vice president and chief commercial officer at GE Digital Europe, Russia & CIS. 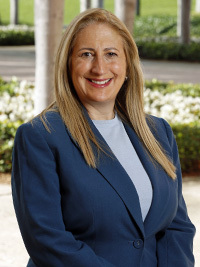 Her division delivers cloud-based solutions that connect industry, transforming industrial businesses into digital industrial businesses by generating insights from machines and translating data to intelligence to drive step-change improvement in productivity. Deborah leads the GE Digital business in Europe, driving strategy, sales, service, marketing and operational activities and she is a passionate advocate of inclusion in the workplace, having been named as an OUTstanding LGBT leader by the FT in October 2017. I have spent my career at the forefront of digital disruption in many industries – bringing digital technologies to law and banking, then moved into more ‘tech’ companies – Samsung, Orange and Google. It has been a privilege to be at the forefront of change in these industries as they have been changed by digitalisation. And now I work at GE Digital, General Electric’s industrial Internet division where we help industrial companies achieve their goals more efficiently through software. The scope and scale of digitalisation in the industrial sector is having an even greater impact on the world than the consumer Internet. For example, GE’s power generation equipment accounts for over half of the UK’s installed capacity. If we can make that equipment run better – using software, we can reduce the amount of fuel they use, or even integrate even more renewables on the grid. It’s an incredibly exciting space to be in. I am the SVP [senior vice president] and CCO [chief commercial officer] for GE Digital in Europe. That means that I lead the European team in helping our industrial customers realise the benefits of digitalisation in their industries. This is a new area – but it is gaining more and more speed. The topics you might read about in the mainstream press, such as artificial intelligence, machine learning, blockchain – these technologies are being applied right now to help companies predict maintenance requirements for their machines improve product quality, or optimise the way that they organise their processes. These productivity gains make a big difference to companies. By applying this ‘Digital Thread’ to its own businesses, in 2016 GE made $730M in productivity gains – and in 2017 we made an additional $1bn. So, it’s a super exciting time and an honour to lead the team through it. GE’s effort to #BalanceTheEquation was started because we believe a company that changes the world, should reflect the world. We’ve been working on this gender imbalance, especially the imbalance we’ve seen in technical roles, by setting good faith goals of increasing the number of women in STEM roles at GE by 2020 and also the representation of women in our technical entry-level leadership programmes. Not only is this the right thing to do; it’s a strategy that is necessary to fully transform into a digital industrial company for the future. 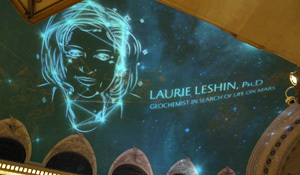 Unseen Stars was an event at Grand Central Station in New York City designed to project the faces of distinguished female scientists onto the iconic ceiling of the main terminal; in fact, GE was the first brand to ever project images onto the ceiling there. In total, we featured 12 women, chosen because they’ve made remarkable strides in their respective fields. They are a representation of the great solutions and advancements you get when women are part of the equation. 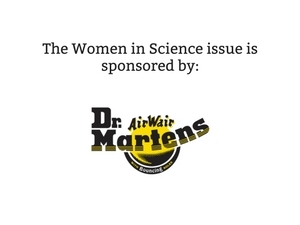 We featured Professor Mildred Dresselhaus, the “queen of carbon”, and the first woman to receive the National Medal of Science in engineering; Dr. Laurie Leshin, a geochemist who has searched for life on Mars; Sabrina Gonzalez Pasterski, a quantum gravity researcher; and GE scientist Danielle Merfeld, an engineer who helps machines talk to each other. This event was tied to our commitment to increase the number of women employed in technical positions at GE. We also wanted to publicly celebrate influential female scientists and engineers, and support organisations like the Society of Women Engineers, in an effort to encourage more young women to consider careers in STEM fields. Choosing Grand Central Terminal gave us a great platform to capture the attention of the over 700,000 people who pass through on a daily basis. We had a positive reaction from the public for our Unseen Stars event. If you’ve ever been through Grand Central Terminal in New York City, you know that it is a fast-paced, energetic and crowded place filled with commuters and residents rushing through to get to their next destination. Seeing people, especially young girls, stop and look up at the light show was amazing. 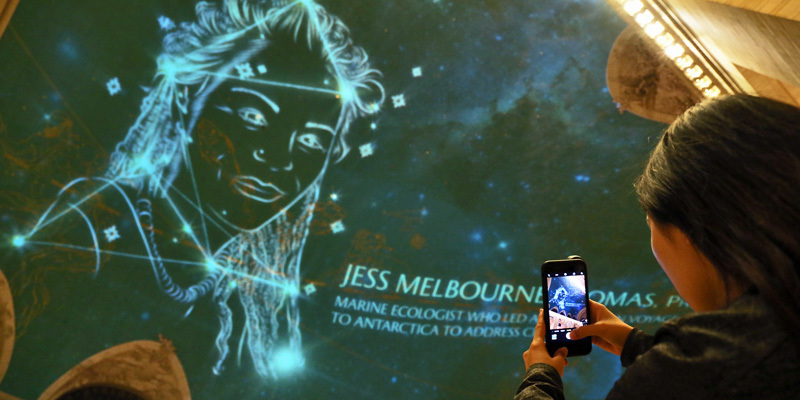 It was exactly what we were hoping to do – shine a light on these remarkable women and spread our message about the importance of women in STEM roles. We also had a tremendous response on social media with over 5 million+ video views as well as positive response from press with over 250 million+ impressions. My advice to girls and women who are interested in careers in science and STEM is to take advantage of local programmes, either in-person or remotely, to try activities and courses in these fields. This exploration allows these girls and women to understand the vast opportunities available to them in STEM fields. One way we do that at GE is through our GE Girls programme. The GE Girls programme is a week-long summer camp and other experiential events offered throughout the year at multiple locations around the world that help to create opportunities for women to participate in STEM activities. This opens the door for girls and women to approach STEM topics while also building our future pipeline for talent. Over the next few years, we will continuously look at what we can do better to recruit and retain talented women by testing and learning, and partnering with schools, students and our own employees. For example, we are re-examining where we recruit from to make sure we are recruiting from schools that have a strong mix of talented women and men to align with our focus on digital industrial capabilities.